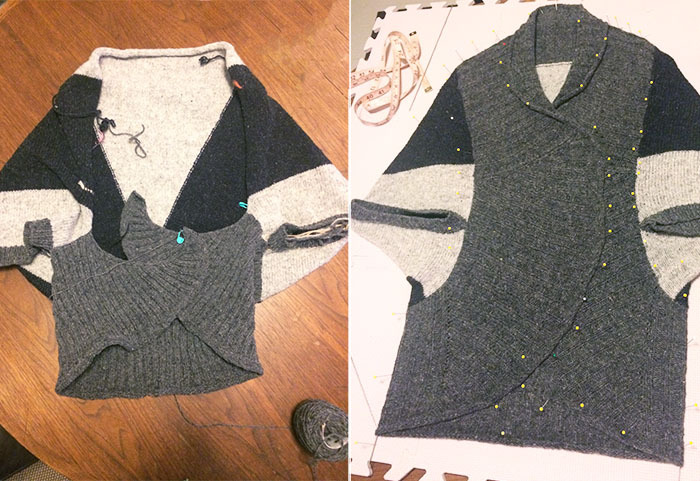 Creating the Escher Cardigan design was kind of an adventure for me. When I finally finished, I felt like I had created a masterpiece–or maybe I was just feeling a little woozy from relearning all the high school trigonometry required to grade out this pattern. Whatever the case, the unusual shape of the garment was definitely exciting uncharted territory. I had to knit, and then reknit, almost every section until I got it just right. My initial design sketch actually looks pretty similar to the end result, but the way it all came together differs a lot from my original idea. The most striking difference is that bold V-shape I added to the back. After knitting the whole body section according to my original proposed idea, I tried it on and realized the fit would be much improved if the arm holes angled down a bit. I went back to the drawing board and came up with this solution. It was a real doozy to figure out, but well worth the effort. 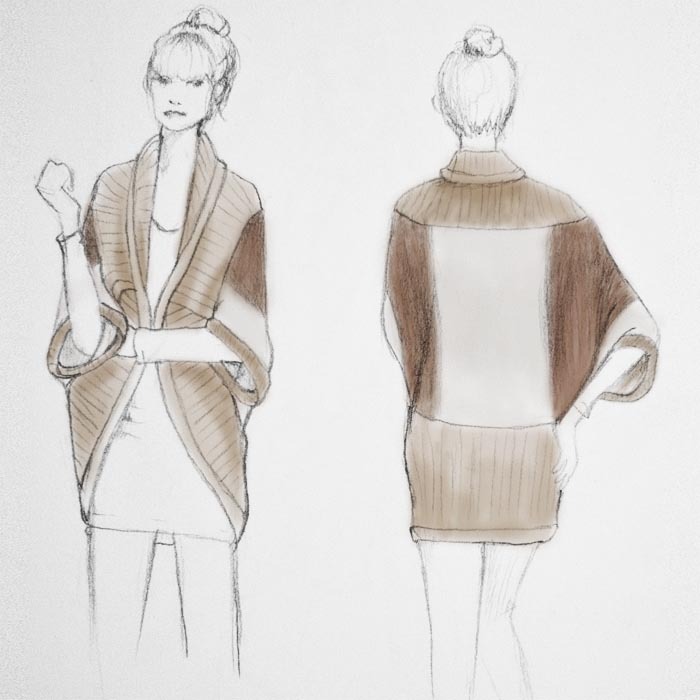 Before Brooklyn Tweed assigned this cardigan an official name, I affectionately nicknamed it the #blobsweater because of the somewhat amorphous appearance of my original design sketch. But as the design progressed, “Blob" seemed less and less appropriate. 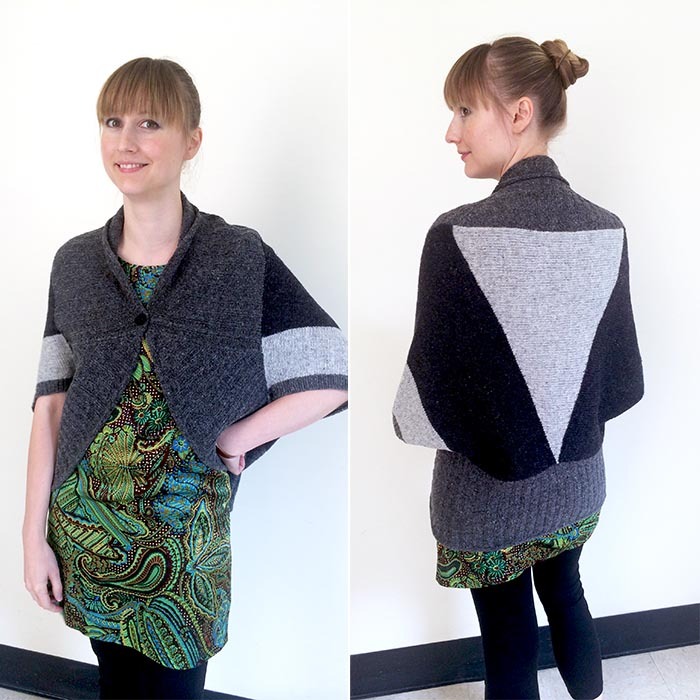 Like when I added the V-stripe, I kept seeing all these wonderful opportunities to incorporate unusual shaping details. By the end, all the missteps, self-doubt and subsequent recalculation had transformed my blob into an elegant, flattering garment suitable for a fancy lady…. 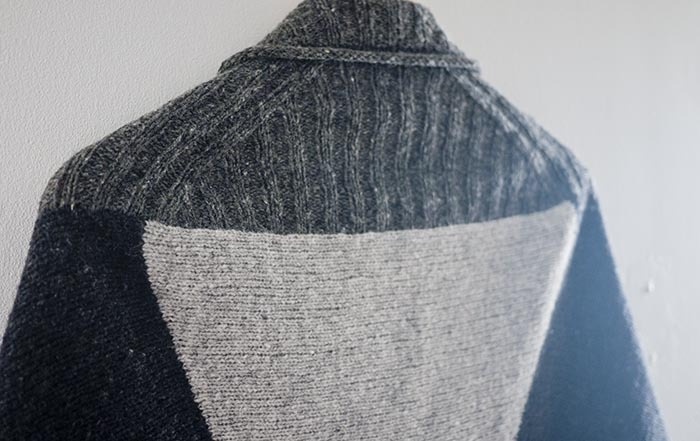 One of my favorite details in Escher is the shaping in the ribbed edging around the shoulders on the back. 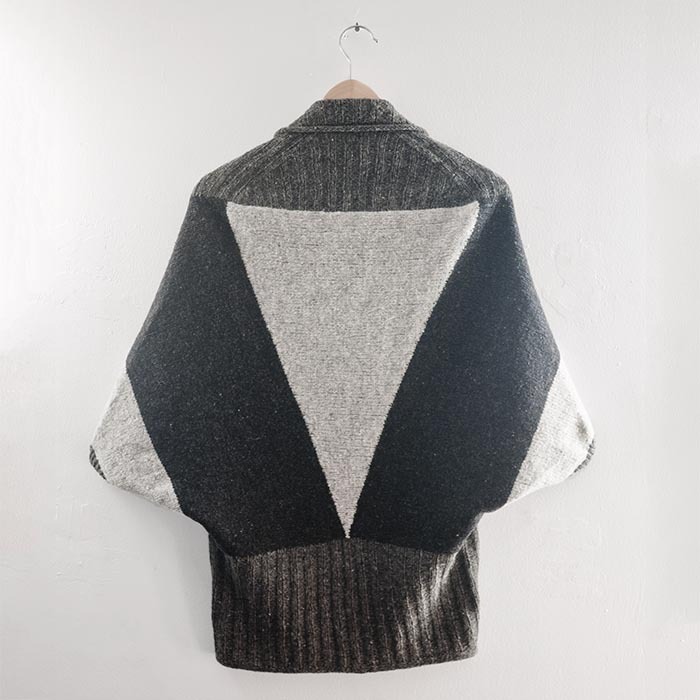 The shaping mirrors the bold V-stripe on the back. This shaping helped refine the fit but also visually balances the design. This was definitely not in my original plan, but I just couldn't help myself. Its little details like this that make my little designer heart flutter. One of my goals with this design was to make it entirely seamless. This created a few challenges for me. The biggest problem was in the rib section, because if I worked it in one long round, it would require a mind-blowing number of stitches on the needle. I have no desire to keep track of 600+ stitches, and I don't expect anyone else to find joy in that either. After much experimentation, I figured out that I could construct the edging in two flat pieces, and still keep the cardigan seamless. The lower part is formed from picked up stitches that are worked straight out from the body. Then the upper section is formed from stitches that are picked up from the body and the sides of the lower ribbing section. 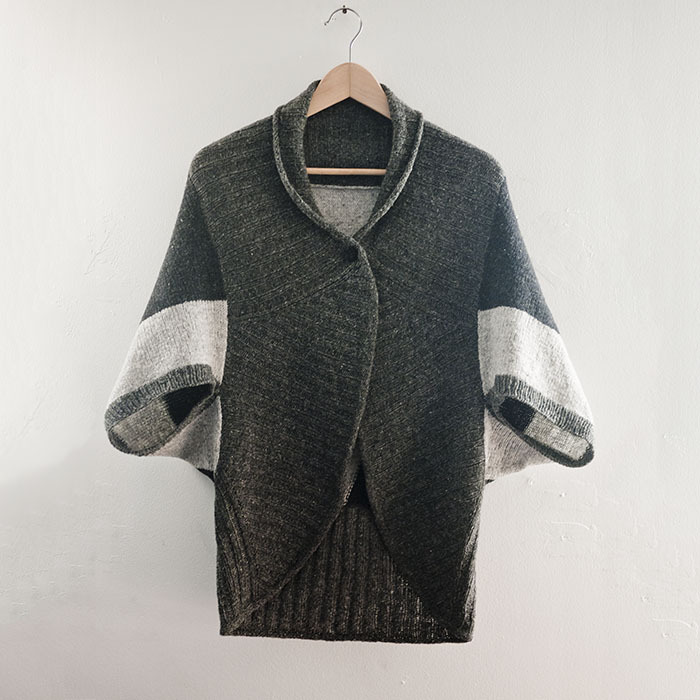 Another little thing you may not have noticed is the knitted covered button that I made for this cardigan. If you recall my Knitted Covered Button Tutorial post I did last year, you know how much I love this technique. I love how the button just looks like it belongs–a compliment to the design instead of a distracting focal point. Unfortunately, Brooklyn Tweed didn't get a photo of the cardigan buttoned, so I feel like it's my duty to shout about this detail from the rooftops! YES, it buttons and it's adorable! Button! B-U-T-T-O-N! This was my fourth Brooklyn Tweed “Wool People" contribution, and the third design I've done with their Loft yarn. 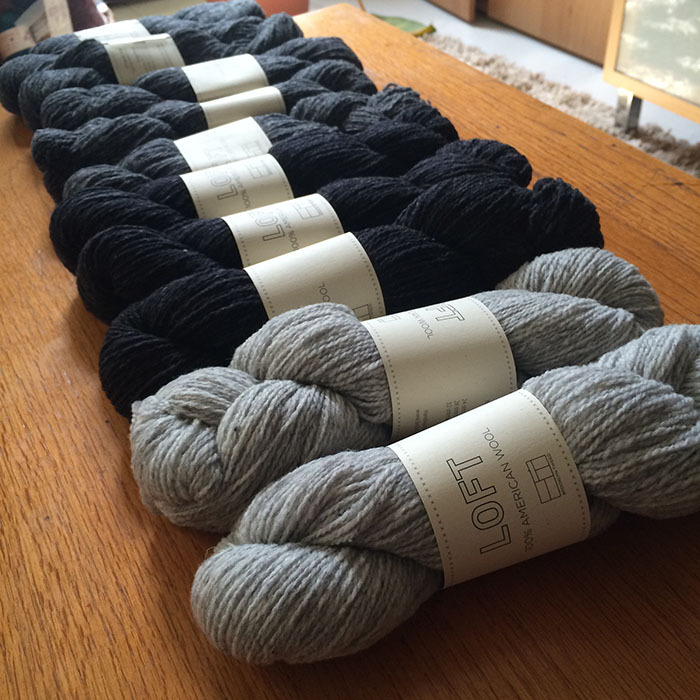 The fact that I keep going back to this yarn is a testament to how great it is. I hope you'll pick some up and knit yourself an Escher too. I can hardly wait to get the sample back. It's sure to be one of my signature pieces and a much loved wardrobe staple! I *love* the flow of your designs! Lovely design... and what if you're not the "average height?" ;-) I'm 5'4" and a bit broader through the middle. Hi Blue, Thanks so much! I'm so glad you like my design. Don't worry too much about the fit through the midsection; the garment is meant to have a lot of positive ease. 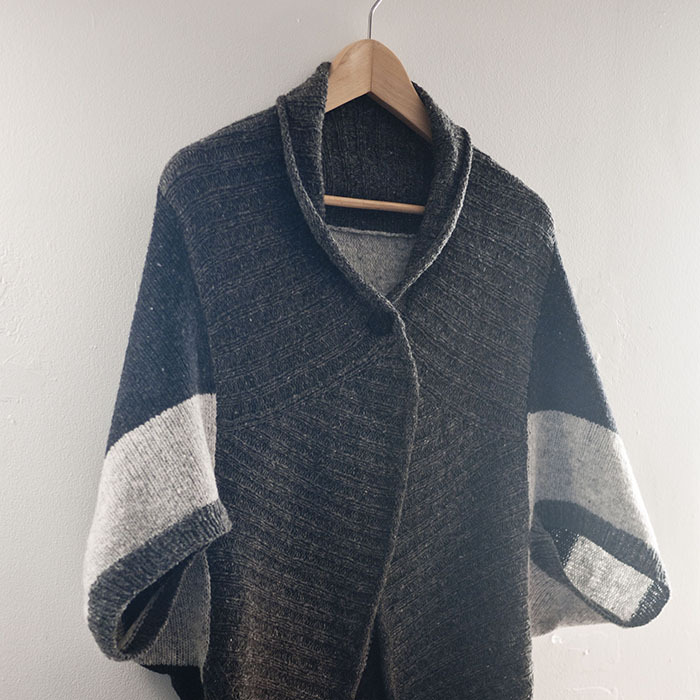 If you're shorter, the result is that the cardigan will be a little longer in the back than what you see on the model–meaning it will cover more of your behind. Since the front slopes upward toward the center, it will look pretty much the same on you, but the sleeve holes will fall below your elbows a little.